The construction of urban highways continues in many places. In Latin America, we see ongoing projects in Santiago (Américo Vespucio Oriente), Lima (Línea Amarilla), Quito (Solución Vial Guayasamín), São Paulo (Rodoanel Mário Covas) and Mexico City (Segundo Piso a Cuernavaca), to name a few. In Colombia, the National Government just announced a new program for improving access to urban areas during the Thirteenth Congress of the Colombian Infrastructure Chamber. In the words of the Colombian President, Juan Manuel Santos, “our purpose is also transforming access to cities. It is not useful to save time in intercity trips if it is lost in urban areas.” With this, President Santos alludes to the great challenge of urban congestion. Constructing impressive highway systems doesn’t lead to more efficient and better transport infrastructure if, within urban areas, traffic prevents the easy navigation of city streets. Colombia has a large road construction program, which aims to complete 5,803 km (3,414 miles), investing close to 40 trillion Colombian pesos (USD$13 billion). This not only impacts the economy and employment in the short term, but it helps in catching-up with a decades-long backlog in national connectivity. The last link, urban access, complements this effort, particularly in the country’s capital, Bogotá. 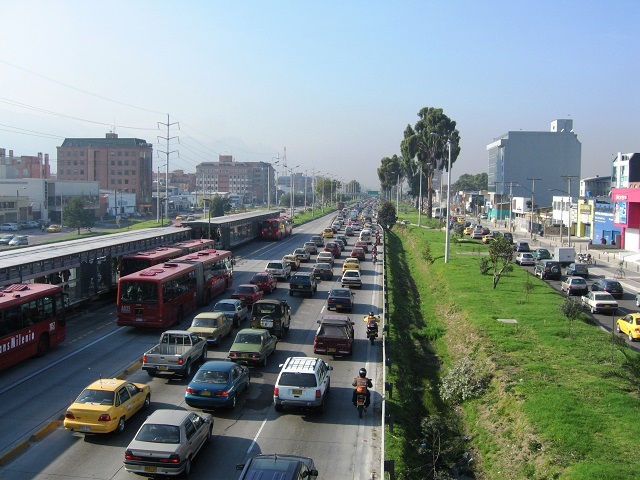 Urban access is helpful in improving national logistics and trips between cities, but it may result in induced demand for automobiles and negative effects that should be mitigated: congestion, urban sprawl, traffic incidents, air pollution and social exclusion. Since the 1950s, experts have recognized the negative effects of increasing urban road capacity. The explanation is rather simple: reducing automobile travel time with freeways is equivalent to reducing cost. Similar to any good or service, cost reduction results in increased demand, and, in this case, increased trips. As Lewis Mumfurd, a technology philosopher, said in1955: “Building more roads to prevent congestion is like a fat man loosening his belt to prevent obesity.” Induced demand, or rebound effect, has been well-documented; new trips absorb between 50 and 100 percent of new road capacity in just three years (see also The Life and Death of Urban Highways). According to Anthony Downs, from Brookings Institution, “traffic congestion is here to stay… and will get worse.” He suggests mitigating congestion with dynamic tolls: higher cost in peak hours and lower costs off-peak. He also recommends complementing toll roads with high-quality, frequent and reliable public transport. By utilizing tolls and devoting space to public transit, highways can be a good use of scarce space; one lane for light rail or buses, for instance, can carry up to 15,000 passengers per hour, while the same lane for cars can carry up to 7,200 people (with four occupants per vehicle), but typically, on average, cars only carry 1.1 people per car—1,980 per hour. Probably the most direct impact of freeways is urban sprawl, and this has been known for a long time. In 1974, Yacob Zahavi, a researcher from the U.S. Department of Transport, found that commute times were very consistent across urban areas (around one hour per day). The anthropologist C. Marchetti, qualified this average value as a “basic instinct” of human nature. This means that if travel time is reduced (for instance with the construction of an expressway), people would tend to live farther away, keeping their “travel budget” fairly constant. The good thing about houses in the periphery is that they usually have outdoor green space. The bad thing is that the resulting low-density development occupies agricultural or protected land. Low density also makes public transport, walking or bicycling infeasible, making residents car dependent, even for the simplest errands. One way to mitigate sprawl is through urban planning: managing urban expansion with compact and mixed-use development, with good quality access to public transport. This is exactly the opposite of what is happening in Latin American cities, where low-density, gated communities proliferate at the urban periphery. Managing urban planning is outside the mandate of road construction agencies, and in many cases, it is not a concern for city mayors. Municipalities around large cities prefer high-income residential dwellings in their territory, as this brings additional tax base. As a result, national planning authorities and metropolitan coordination may be required to help mitigate sprawl. Another impact of urban freeways may be an increase in traffic deaths and injuries (see Why Reducing Speeds Is Key to Improving Traffic Safety). A few ways to improve road safety are to separate road users, control road-access and keep pedestrians and bicyclists outside high-speed lanes. It is a matter of design. There are also impacts on air pollution, resulting from increased vehicle-km (mileage). An economist’s approach to this would be to charge for these externalities; not only have congestion tolls but also emission charges. While this is politically difficult, it is progressive, as revenues can be used to improve the quality of public transport, which is used by the majority of people in Latin American cities. Last, to make urban freeways inclusive, it is necessary to prioritize pedestrian and bicycle infrastructure and public transport. Road infrastructure is not only about making fast lanes for cars, but it is about complete avenues, with wide sidewalks and safe bicycle and transit lanes. There are good opportunities in the announcements by the Colombian Government to invest in urban access, but there are also challenges. National and local governments can confront these challenges by considering road-use planning, dynamic tolls, controlling access to fast lanes and providing for all road users, particularly the most vulnerable. Otherwise we will be putting out fire with gasoline.